← Frugal DIY Plant Holder Out of Old Pans! Who says that eating healthy Organic Foods doesn’t mean you have to spend a lot of money. But with the right tips for buying organic food, your money will be better spent! Use these tips to buying organic food on a budget and cut your food budget in half. Eat Real Food on a Budget. We want to eat healthier and have foods with no pesticides or preservatives, but Buying Organic Food can be so expensive. Walking into the grocery store in search of healthy food can leave you feeling robbed of your money. Next thing you know you are now suffering from some serious sticker shock. 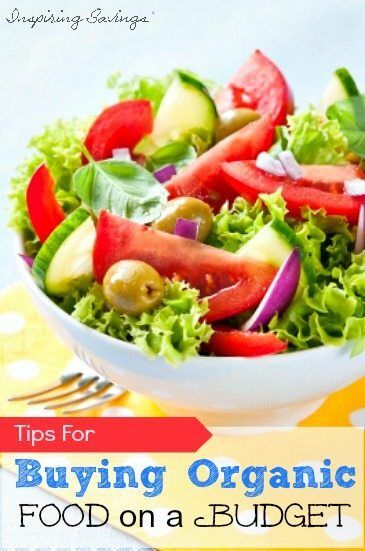 What can you do to get that healthy food on a budget? 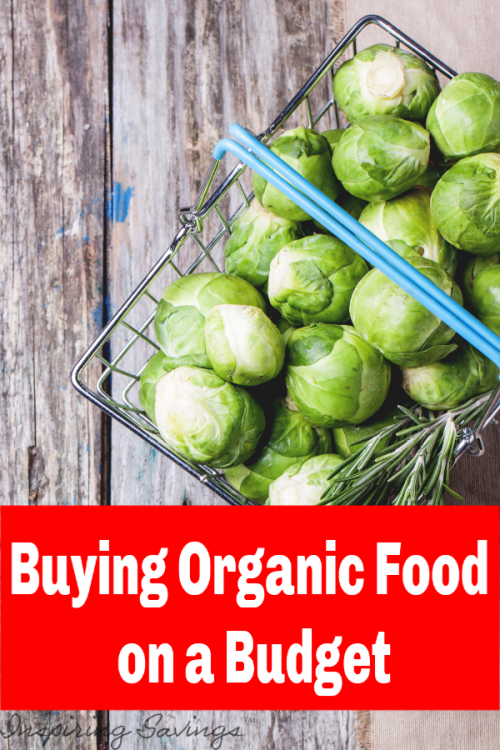 There are many ways you can eat organic without blowing your food budget. I believe eating healthy food is the most important element to a healthy lifestyle. Eating is something we do (at least) three to six times a day, every day. It’s what fuels our bodies to get the exercise we need, nourishes our brains to support our mental health, and builds up our immune system to fight off sickness. Food affects the way we feel, the way we look, our energy level and our general health. Living healthy means that Nutrition is 80% key to a healthy lifestyle. I am sure most of you have heard the story about my son having behavioral problems the very first month of 4th grade. I just happened to be reading a book on nutrition. When it dawned on me, “his diet needs to change”. It was a light bulb moment for me. I pulled out all foods that contained high fructose corn syrup, red dye, nitrates and any food items that were labeled as enriched. Within one week’s time, I had my son back. As the saying goes, “We are what we eat”. Don’t get me wrong, I love my coupons and I do save some serious cash. My family’s dietary needs changed and so did my tactics for saving money. It wasn’t difficult to stay within the same budget and buy healthy food. These are just some of the many tips that I now use to help save money, all while keeping my family eating healthy. And, I’m standing on my soapbox to say that it IS possible to eat healthy without spending a fortune. When you buy from the bulk bins you skip both the packaging and the marketing – why waste your money on things that don’t add value? Search the bulk bins at your local grocery store for items such as dry goods; like flour, oats, grains, beans, pasta & nuts. Some stores (co-ops) do sell oils, nut butter, honey, and other wet foods in bulk. Some require you to bring in your own jars. This also saves on packaging. Many conventional grocery stores have bulk bins these days. Just beware – not everything in there is healthy – I often see candy and snack like food in the bulk bins these days! If you have a farmer’s market in your town or nearby, make a point of going. You will get local produce and most of it is organic (be sure to ask if you’re not sure!) Some grocery stores in my area have a ‘local’ section and I always find great organic fruits and veggies at a good price. Much of these produce items can be frozen for later use, so stock up when you find a great deal! To visit one of your local Farmer’s Market search here. Many companies that sell organic items have a good presence on Social Media. Make sure to look for your favorite brands on Facebook, Twitter and Instagram. Being a social media follower will give you heads up on sales and special promotions, including coupons. Make sure you are also checking their weekly sales ad. Check out a company’s website for coupon deals, too. If you really like a brand or store, sign up for their email list. Whole Foods Market has coupons weekly, and your favorite store might as well. There are even coupon sites that focus on organics, such as Mambo Sprouts, Common Kindness, Hopster. Plus don’t forget to check Inspiring Savings weekly Organic & Natural Printable Coupon round up. Many coupons can be found on the products themselves in the store. Many stores will put blinkies or tear pads of coupons right by the products. So, keep those eyes peeled. With a little effort and research, you will find that you can make a lot of products yourself. Try making your own granola and juices to save money. If your fruit gets too ripe, freeze it and then make yummy smoothies for the kids. Meat and dairy are worth paying a bit more for since the risk of pesticides and antibiotics is higher. You can make your meat last longer by only using half of the amount needed in a recipe and then using organic beans to make up the rest. You will save money and get more fiber, too. Buy organic chicken, but buy the whole chicken and not the higher priced pieces. When you cook chicken, save the broth to make soups or gravy later. Start out with small steps on your journey to go organic. You will find that you are able to stretch your dollar while still enjoying healthy and organic food. But the KEY to Buy Organic Foods on a Budget is to purchase those items that you can while on sale and with a coupon. Remembering to stock up on those items until the next sale. Overall, be smart about your food choices and know that buying organic when it counts can have a huge impact on your health.